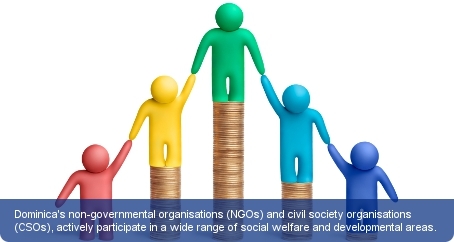 Dominica’s non-governmental organisations (NGOs) and civil society organisations (CSOs), actively participate in a wide range of social welfare and developmental areas. A large part of the country’s international NGOs deal with natural disasters and the country’s close encounters with hurricanes. Oxfam, the Red Cross and Missionary Flights International are vital organisations which can assist with the restoration of the agricultural sector and livelihood recovery from natural diasters. The Dominica National Council of Women and Dominica Conservation Association are the country’s more prominent NGOs. The Dominica National Council of Women teaches preventive education about domestic violence and maintains a shelter where counselling and mediation services are available. The Dominica Conservation Association is the country’s most influential environmental NGO. It lobbies various conservation interests and educates Dominicans on environmental matters. NGOs must register as non-profit organisations with the Attorney General. Their non-profit status is outlined in the Companies Act 21 of 1994. Any organisation denied permission to register by the Attorney General has the right to apply for judicial review. Currently, there is no Trade Union Congress in Dominica, with the Trade Union Act of 1952 being the sole piece of legislation on trade unions which caters for the protection, registration and ethics of all union organisations. Workers currently have the right to strike, however less than 10 percent of the work force is represented by unions.